Hey folks, I'm very excited to be back to blogging, as I mentioned in a previous post. I do want to point out that do still have this issue where I have two blogs that I'll be operating. I've decided that any time I have a topic that is going to be of a technical nature that would appeal to my podcast consulting/coaching clients, I'm going to blog about on my business website at PodcastAnswerMan.com. If I feel that such a topic would be of interest to the overall gspn.tv community as a whole, then I'd simply come here on the gspn.tv Community Blog and put a short note about the post with a link to the full story. This just so happens to be one of those topics. 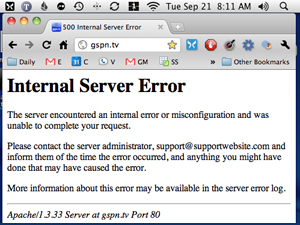 On Friday evening, we suffered from a pretty severe hacker attack on the gspn.tv website. Today, I woke up with a large number of emails explaining that out sites were down once again. To read about the full story, click here. Previous post: 038 BL – Season 10 of The Biggest Loser Starts This Week!